Hair Lowlights – What is it? Can I do it at home? Hair color lowlighting and high lighting are techniques best left to a professional hairdresser. What may look like a savings when you buy an over-the-counter hair color lowlights kit can end up costing you easily $100.00 or more to remedy at a hair salon. Not to even mention the embarrassment of a bad hair color lowlighting job. Corrective hair coloring lowlights is not cheap. It’s not that I’m against home hair color lowlighting. This type of hair coloring takes a special technique that is undeniably best left to a professional hairdresser. Even for the hairdresser it is a skill that is built on and perfected after lots of experience. It takes an artistic eye as well as a skilled hand and a know-how of hair coloring to achieve stunning results. The difference between stunning and tiger stripes lowlights is huge! Hair color lowlights hair may best be explained as the same technique as high lighting but with the introduction of darker hair color tones instead of lighter hair color tones. This can especially add depth to hair that has been over-lightened. The hair colorist may weave sometimes up to three different hair colors into your hair. 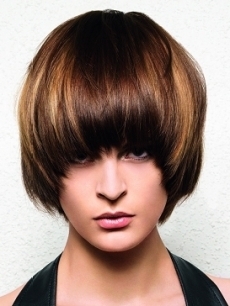 If a dramatic, chunky look is the goal, heavier chunks of hair will be colored. If a subtler look is what you are after, the finest of sections are taken to add lowlights to. The size of the sections as well as where the hair color that is applied makes all the difference in the end result . . . not to mention the hair color formulation! Normally, this is done with foil in order to keep the hair color off the rest of the hair and the scalp. Can you see now why hair color lowlights is best left to those who have much experience at it? TIP : Your best way to find a great hair colorist is to ask around. Start noticing hair color, and stop the woman whose color you really like and ask who she goes to! How to Get the Dark Hair with Caramel Highlights You Want! February 1, 2014 By: Barb Quinn Hairstyle Blog Leave your comments (20), Your input matters. My natural hair color is a light brown and i dyed it alot and it ended up being blonde with yellow tones but like in random spots. i had someone do my hair but now i feel like its an old lady white. and idk if i really like it. could i put lowlights in it? i really dont want it this white. i would have rather had it the other way. but what color lowlights should i do? and can i do them myself? I want to overall darken my hair from golden blond to chestnut brown. I don’t want to full out dye it, I want to lowlight it a lot so it looks darker. I am doing this at home. What is the best way? Cap, Foil, or just painting my head with color? I have seen the responses saying that you should let professionals do the lowlights. However, every time I have a pro put in lowlights they last only through about 2 shampoos. What should they be using in order to be permanent? I have a natural auburn color, but since the summer has just ended, I have a lot of natural blonde highlights that I don’t like. I am considering getting my hair done with a dark chocolate color and dark red lowlights. Do you think this would look good? I have a fairly medium skin tone, but it lightens a lot in the winter time. Thanks! Hi…i have dark blonde hair and i want to get brown lowlights. Do you think i should get light blonde highlights as well to blend it in more, or do you think i should get my whole hair dyed light blonde and then just het the brown lowlights? i have light to medium brown hair. i want to darken my hair and add a type of red lowlights or highlights . do you have any suggestions as to what colors i need to ask for. What you’re suggesting is asking for more colors than I would want to see in any one persons hair… and to get it back to any one color will take corrective coloring— expensive. But I’m not you, my answer is no, it won’t look good. I think you’ve done a pretty good job right here. If you say what you’ve written that should be enough for your hair stylist to understand. I have dark brown hair, and already have blonde highlights(for dimension). I was thinking of getting black lowlights, and dark blue highlights in my hair. Would this look good? i am getting my hair done soon and i am gettin blonde highlights put in and i also want like pink tints put in. i dont want pink highlights. i want them to start on the middle layer of hair and just show through the top layer. so they wont start from my roots and also i dont want them to finish at the tips of my hair. how do i explain this to my hairdresser? I asked for highlights from my stylist and he dyed my whole head blonde with highlights. i cant wait to get back to my natural color but im scared to dye it at home because it might not take and it might look green to go from blonde to dark brown. i am scared also to get my hair stripped for fear that my already brittle hair will fall out. what should i do??? my hair is brown.. somedays it can be light, and other days it can be dark. i was thinking of getting chunks of it black. like streaks, but bigger chucks. is this a good idea or will it look bad? thanks. My hair is dark blonde, i thought about goin a few shades darker and addin blonde and red highlites, but the lowlites kinda sounds neat too. So im think maybe add some lowlites of shades (about 2 or 3 shades darker) and maybe some blonde highlites as well? Opinion please?? If a professional did the highlighting, you might ask them to tone it down for you. If you just had this done they may not charge you for the toning. The best way to correct this is by toning- that would keep the rest of your hair from getting darker. Toning would mean to put on a permanent color-lighter than your own, but (x) amount of shades darker than the highlighted hair. You could call the 800# if you used a box color and see what they have to advise in their own colorline. I had highlights put in my hair. They came very light, almost platinum. I would like to make it a little darker. Should I use a semi-permanant rinse and how long will it last. The bottle says 7-8 washes. A “shampoo cocktail” described in the above article may help. But if you have roots showing they will need to be treated differently than the rest of your hair. A rinse will not lighten your hair. Hi…..I was wondering if there was a color rinse that I can use to “lighten” my hair. My hair is too dark(black) for my complexion and is there a rinse I can use to color my hair to medium brown.